The 12 gauge, developed in the 1870's, is one of the most effective firearms of our age. Used by the military, law enforcement, hunters, sport shooters, and those looking to defend themselves, the 12 gauge has more than proven itself to be one of the best short range firearms in the world. 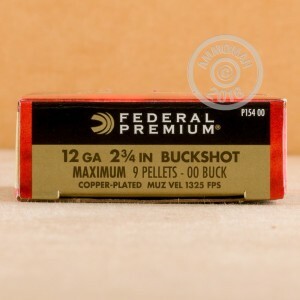 Since its debut in 1922, Federal has been putting out some of the best ammunition in America. 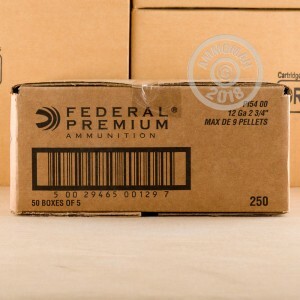 If you need high quality ammunition at an affordable price, Federal is the way to go. These Federal Vital-Shok shells measure 2-3/4" in length and carry 9 pellets of 00 buck shot. that leave the barrel around 1,325 feet per second. 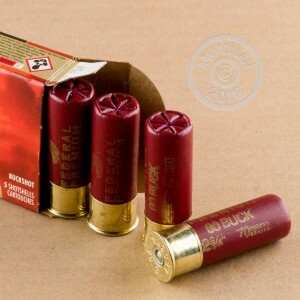 With these 00 buckshot shells you have the reliability and hard hitting knockdown power you need for hunting and and self defense applications. Don't forget, all orders over $99 will ship for FREE from AmmoMan.com!